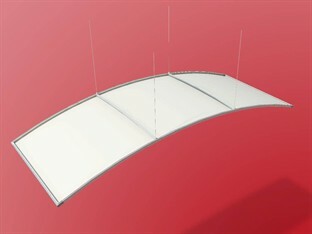 If you need to add curved ceilings into a linear space, the Tetra does it well. Formed with a lightweight perimeter frame, varying fabric options provide great solutions for screening from sunlight, hiding existing ugly ceilings or lowering the perceived ceiling level. Coated Polyester – FR to BS 5867 Pt2.